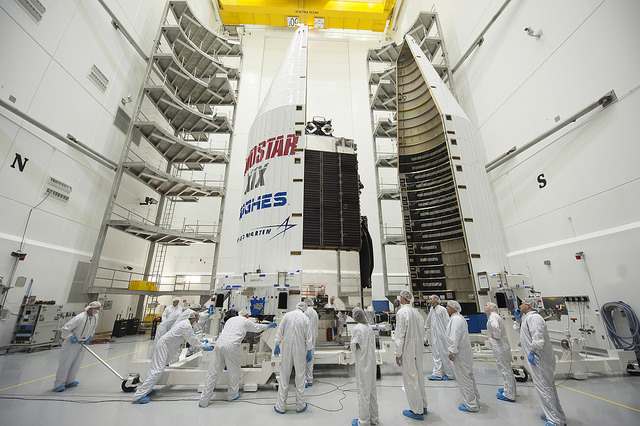 December 12, 2016 – The EchoStar XIX satellite has been encapsulated in its protective launch vehicle fairing. It is scheduled to launch December 18 aboard a United Launch Alliance Atlas V 431 rocket contracted through Lockheed Martin Commercial Launch Services. For encapsulation, EchoStar XIX was connected to an adapter and then enclosed in the four-meter fairing or “nose cone.” The satellite will now be transported by truck to Space Launch Complex 41 where it will be lifted by crane and mated with the Atlas rocket. EchoStar XIX, also known as JUPITER 2, is built by SSL in Palo Alto, California. The new Ka-band satellite will help meet the growing demand for HughesNet Gen4 high-speed satellite Internet service in North America. EchoStar Corporation, based in Englewood, Colorado, is a pioneer in secure communications technologies through its EchoStar Satellite Services, EchoStar Technologies Corporation and Hughes Network Systems business segments. Lockheed Martin Commercial Launch Services markets the Atlas V to commercial satellite customers worldwide. The Atlas family of rockets provides the most reliable lift in the commercial market, and such precise delivery into orbit that customers can use the excess fuel to extend the life of a satellite, bringing more value to the mission.